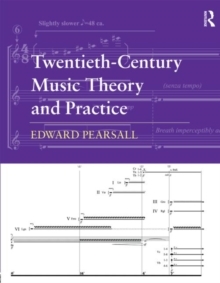 Twentieth-Century Music Theory and Practice introduces a number of tools for analyzing a wide range of twentieth-century musical styles and genres. It includes discussions of harmony, scales, rhythm, contour, post-tonal music, set theory, the twelve-tone method, and modernism. Recent developments involving atonal voice leading, K-nets, nonlinearity, and neo-Reimannian transformations are also engaged. While many of the theoretical tools for analyzing twentieth century music have been devised to analyze atonal music, they may also provide insight into a much broader array of styles. This text capitalizes on this idea by using the theoretical devices associated with atonality to explore music inclusive of a large number of schools and contains examples by such stylistically diverse composers as Paul Hindemith, George Crumb, Ellen Taffe Zwilich, Steve Reich, Michael Torke, Philip Glass, Alexander Scriabin, Ernest Bloch, Igor Stravinsky, Bela Bartok, Sergei Prokofiev, Arnold Schoenberg, Claude Debussy, Gyoergy Ligeti, and Leonard Bernstein. This textbook also provides a number of analytical, compositional, and written exercises. The aural skills supplement and online aural skills trainer on the companion website allow students to use theoretical concepts as the foundation for analytical listening. Access additional resources and online material here: http://www.twentiethcenturymusictheoryandpractice.net and https://www.motivichearing.com/.